During Food Check-Out Week when we are recognizing farmers for producing safe,abundant and affordable food, we also see the needs of many families in our community during these tough economic times. On behalf of the Benton County Farm Bureau Women's Comittee, I presented a check this week to Shannon Green, Food Marketing Coordinator of the Samaritan House for a donation to the Snackpacks for Kids program. The Snackpack program is just one of the many programs of the Samaritan House that helps to feed and clothe families in our community. Snackpacks for Kids provides weekend snacks to children who are most at risk for hunger on the weekends. 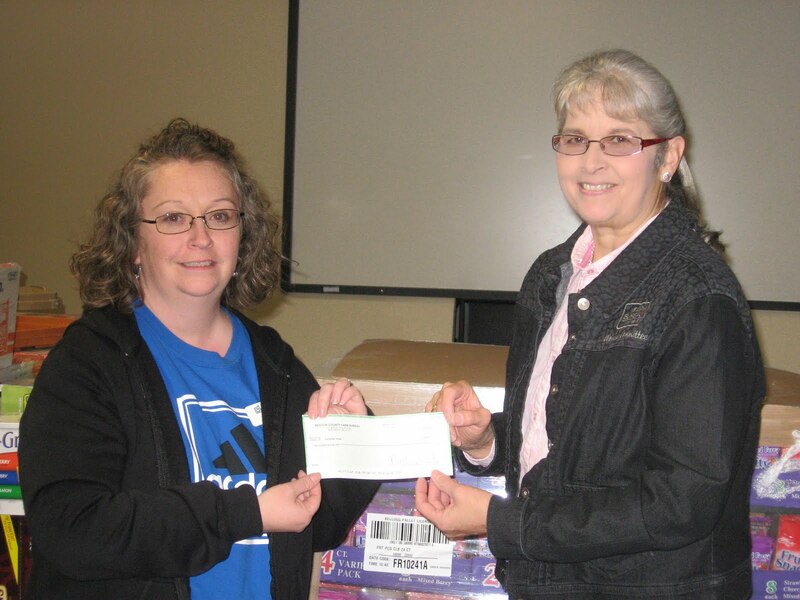 This program reaches children in Benton,Carroll,Madison and Washington Counties. During the current school year 3300 children in sixty four elementary schools,Head Starts, and Early Childhood Centers receive a snackpack each Friday. Each pack contains eight to ten healthy weekend snacks. Food products that are routinely packed are: animal crackers,beef jerky,cereal, cheese crackers,fruit bars,fruit juice boxes,fruit snacks/roll-ups,pretzels,pudding cups and Vienna sausage. Volunteers meet weekly to prepare boxes for each school and deliver them for distribution. When they reach the school, the counselor will put designated snacks into the children's backpacks to take home for the weekend to make sure they will have food until they come back to school on Monday. If you are interested in donating to this program you can call the Samaritan House at 479-636-4198 or reach Shannon by email sgreen@samcc.org. I can't think of a better way to celebrate Food Check-Out Week than by helping others in our community! It's a great program! Our county is doing the same thing this year - great minds think alike!